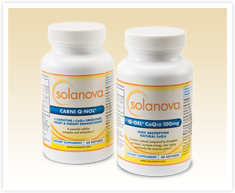 Solanova’s products have been developed with the singular objective of helping optimize individual health and well-being using the vast resources of nature. Since 1989, Solanova has provided cutting-edge, top quality nutrition supplements formulated to deliver potency, reliability and optimum absorbability. Their patented Bio-Solv® process makes their products water soluble as well as oil soluble, meaning they will dissolve in fat tissues and cells in addition to being absorbed in the bloodstream which results in very high absorption by the body.